Finding the perfect battery charger integrated circuit (IC) for your portable electronic device design is not always easy, especially when you need a battery with more than one cell in series (1S) for higher voltages while achieving fast, cool charging in a small board area. In such cases, a boost charger may be what you are looking for. Here are four reasons why you should consider using a boost charger. 1. Boost chargers allow you to take full advantage of 5-V USB’s convenience. Let’s look at one of the most widely adopted charging inputs in portable electronics – the USB charging port. Remember when every portable device had a different kind of adapter, with barrel-jack charging ports? As USB charging ports became mainstream, it’s now possible for consumers to carry only one adapter and a couple of cables for all of their electronics. USB charging has truly become a way of life. A 5-V USB adapter and cable (either with a Micro B or a USB Type-C™ port) are cost-effective due to the large number of equipment suppliers; sometimes manufacturers can even exclude adapters from the product box because consumers already own one. A 5-V USB can be designed with up to 15 W of power with USB Type-C, which is enough for most small-size applications. Using a 5-V USB with a two cells in series (2S) battery is a popular charging combination and a boost charger is required to make this happen. Why? Because it not only takes a 5-V USB input and boosts it up to charge a lithium-ion (Li-ion) battery with 2S, but a high performance boost charger does so in a highly integrated and efficient way, allowing you to get the most out of your portable device designs. 2. Get the most out of 2S configurations with a boost charger. Many battery-powered devices use 1S batteries to keep products simple and cost-effective. However, if the system includes higher-voltage blocks, you will need a boost converter to jack up the 1S battery voltage to power them. With a 2S battery and a higher voltage, you can exclude a boost converter and get a longer battery run time. Applications in which 2S batteries could help include electronic point-of-sale devices or portable photo printers where systems may need a high-voltage print head. Additionally, wireless smart speakers might need a high voltage to supply dynamic current pulses to audio amplifiers, or a small power tool might use a 2S battery to drive the motor effectively and powerfully. 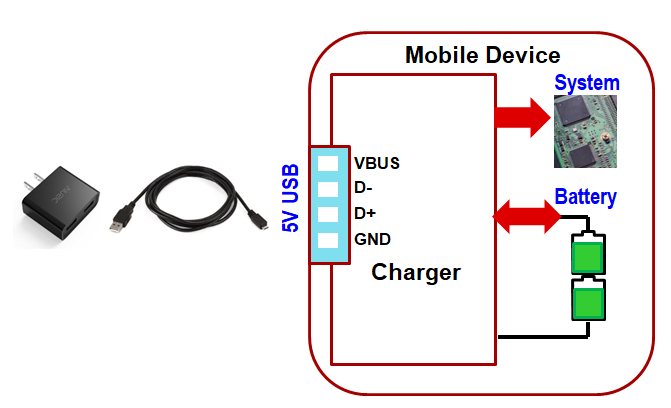 An example of a typical 5-V USB 2S battery boost charging system is shown below in Figure 1. It is also challenging to operate a Li-ion battery (specifically 1S) at low temperatures, as its internal impedance can increase dramatically. In smart home applications used outdoors, like wireless security cameras and video doorbells, when the temperature approaches 0°C, increased battery internal impedance will cause a significant reduction in the battery’s output voltage. The 2S battery configuration provides more voltage headroom to play with. 3. Integration eliminates the need to choose between a simple bill of materials or increased functionality. The integration of boost charging solutions makes the design process simple, with loaded features in a small size. Do you want your system to turn on instantly when the user plugs in an adapter, even with a depleted battery? Do you want to extend battery life? If the answer to either of these questions is yes, an integrated power path will help you reach your goals. The power path manages the battery’s field-effect transistor (FET) between the system and the battery. This feature guarantees a minimal system voltage so that the system can start when the battery is low, giving the device an instant-on feature. The power path also reliably cuts off the trickle charge when the battery is full to avoid overcharging, thus protecting the battery and extending its life. A USB Micro B adapter uses D+ and D- to indicate its power sourcing capability. TI boost chargers integrate D+/D- (or DP/DM) detection and can configure the charger’s input current limit when the adapter plugs in. If the adapter is not a standard USB, advanced algorithms like the Vin Dynamic Power Management (VINDPM) and Input Current Optimization (ICO) will help the device detect the adapter’s maximum current capability. There are more features you can use to make a great charging system. The USB On-The-Go (OTG) feature powers a peripheral device connected to the USB. In OTG mode, the boost charger operates reversely as a buck converter to provide a 5-V bus voltage to the attached device with a current limit. This function saves a buck converter, an inductor and sometimes a power switch. The internal analog-to-digital converter keeps the system aware of what’s going on around and inside the IC. The integrated AC overvoltage protection FET protects the system from input overvoltage events. Figure 2 illustrates the BQ25883, our new boost charger that integrates the power path, D+/D- detection and OTG, among other special features, into one IC. 4. Select the right boost charger for your unique considerations. Our new boost charger family, BQ25882, BQ25883, BQ25886, BQ25887, provides several options to meet your application requirements. I2C chargers offer great flexibility by setting and changing the charge profile with software and by providing charging status to the system host. The stand-alone charger enables an easy charging setup with external resistors. The cell-balancing version employs an advanced algorithm to quickly balance the voltage of the two cells while charging within one cycle. This is an important feature for products that have two loose cells or that target a long battery life. You can see all of our boost charger family and each of their unique features in Table 1 below. We understand that each portable device design has unique considerations and we want to make it easy to choose the best charger for your design. These four points express the benefits of using a boost charger with 5-V USBs and 2S batteries. We hope you consider a boost charger in the future for a convenient and high performance product. Kick-start your design with the 2-cell battery boost charger system reference design using 5V USB. Read the application note, “A USB charging solution for 2-cell (2S) discrete battery cells using the BQ25887’s cell-balancing functionality”. Planning to use 5-V USB Type-C? Consider the TUSB320LAI USB Type-C port and logic control IC. Need more power than 5-V USB? Consider the BQ25713 1S to 4S buck-boost charger and USB Power Delivery controllers. Will there also be another member to this family? I ask since these products fulfill nearly everything I am looking for! Will there be a version that will combine any of the BQ25882/3/6 with that of the BQ25887? * Package: ?? QFN-?? / QFP-?? Borislau Jevic Hi Borislau, sounds like you need a BQ25882/3/6 + cell balancing. We don't have exactly this in the family, however, the cell balancing function can be implemented by a battery gauge. Check out the reference design www.ti.com/.../PMP40496 as an example. Hope this helps.